In the final months of 1864, as fall moved relentlessly towards winter, the last great drama of the Civil War’s Western Theater took place in central Tennessee. It would pit two opponents with decidedly differing views of war against one another, and see the last major battles to be fought on the far side of the Appalachians. The resulting campaign would, therefore, end a process that had begun at Fort Henry in early 1862 and write the final chapter in the theater that had, for all intents and purposes, decided the war’s eventual outcome. 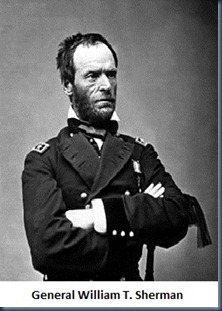 General William T. Sherman had successfully taken the city of Atlanta in September 1864, having pressed steadily against the skillful defensive maneuvering of General Joseph Johnston and the Army of Tennessee, and then finally smashed the offensive counter attacks of Johnston’s successor, General John B. Hood. The loss of this vital industrial center and transportation hub now left the Deep South seemingly at Sherman’s mercy, and the loss was as much psychological as it was military and economic. In late September, Confederate President Jefferson Davis traveled to Palmetto, Georgia to confer with Hood and develop a strategy for dealing with Sherman’s next move. It seemed clear that Sherman would eventually strike out from Atlanta towards either the Gulf coast or the Atlantic. However, the question was what Hood should do to stop him and, frankly, what he was capable of doing. He was facing an opponent who was numerically superior, well supplied, and possessed strong morale. The Army of Tennessee had been battered Sherman’s offensive against the city. More so, the heavy casualties inflicted upon the army after Hood took command did not make the general very popular with his men. In any case, Davis needed Hood to somehow drive Sherman and all Federal forces out of Georgia and, hopefully, out of Alabama and Tennessee, as well. 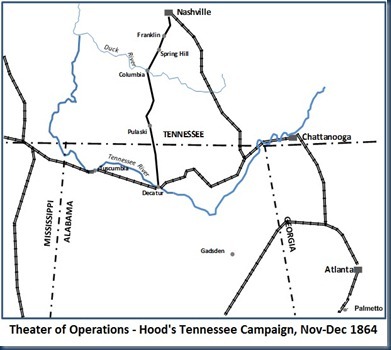 Hood proposal to Davis called for him to move his army north to threaten Sherman’s primary supply line, the railways leading to Chattanooga and Nashville. This, Hood concluded, would force Sherman to either come after the Confederate army or move to the coast, where he could be supplied by sea. If the Union general chose the former, Hood would fall back into the rugged terrain of northern Georgia or Alabama and bring Sherman to battle on ground advantageous to the Confederate army. If, on the other hand, Sherman struck out for the coast, Hood would follow him, continuously destroying his lines of communication, harassing his rear, and eventually forcing Sherman to turn and fight at a place of Hood’s choosing. Hood also foresaw the possibility that Sherman might choose to divide his forces, sending some to Tennessee to guard the Union rear. In that case, Hood proposed to fight the Union forces in Georgia, drive them out, and then deal with the remaining Federal elements in Tennessee. Davis liked what he heard, but added one proviso: Should Sherman move north to protect the rail lines, he wanted Hood to withdraw to Gadsden, Alabama. Once there, Hood could be resupplied via the railways from southern Alabama, which remained in Confederate hands, while still threatening Sherman. Hood agreed to the president’s idea but, most importantly, he promised Davis that, whatever direction Sherman moved, he and the Army of Tennessee would follow. Davis departed for Richmond on September 27, 1864, and, two days later, Hood marched his army out of Palmetto towards the line of the Georgia Central Railroad, which linked Atlanta with Chattanooga. Sherman quickly realized that Hood was on the move and marched part of his army north to intercept him. However, the Union general’s cavalry had difficulty locating Hood and, as a result, Sherman was unable to bring him to battle. For his part, Hood moved quickly and screened his movements well. But, Sherman refused to divide his forces as Hood had hoped and, while the two men would play cat and mouse for three weeks, the climactic battle Hood wanted never came to fruition. By October 20, Hood had managed to reach the safety of Gadsden, but Sherman ceased to follow him. Sherman had decided to take an approach neither Hood nor Davis had foreseen. While Sherman would, indeed, head for the Atlantic and would decide to create a new army to protect Tennessee, the idea of Hood threatening his lines of supply and communication would not concern him. Taking a page from Grant’s Vicksburg campaign, he would abandon any lines of supply, providing for his army via foraging as he struck out for Savannah. He was going to eliminate the need to worry about his supply lines simply by not having any. At the same time, he directed General George H. Thomas in Nashville to assemble whatever forces he could muster into an army and deal with Hood should the Confederate general make a move north into Tennessee. At this critical juncture, Hood apparently decided to revise the strategy he had agreed to with Jefferson Davis. His new plan was nothing if not wildly imaginative and highly aggressive, and, thus, very characteristic of John Hood. 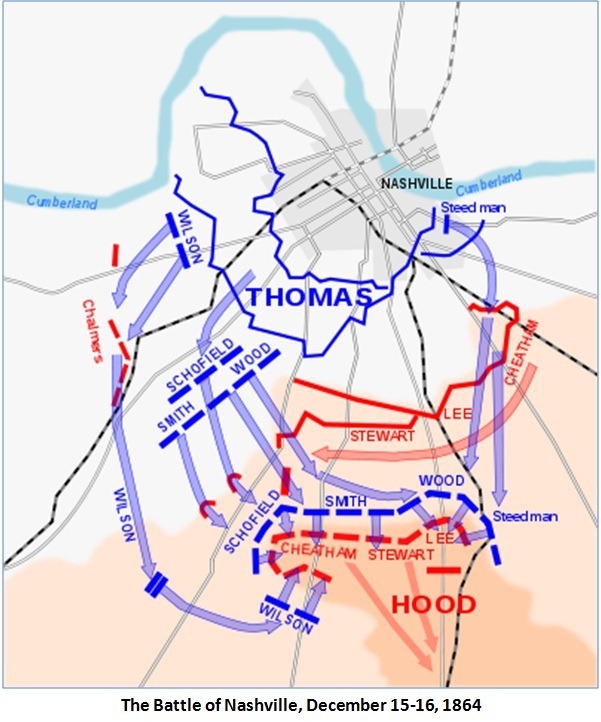 In Hood’s new vision of operations, he would quickly strike northward into Tennessee, and destroy Thomas’ scattered forces before they had a chance to merge. Then, rather than turning to follow Sherman, he would continue north into Kentucky, rally new recruits, gather supplies, and threaten Ohio. This, in turn, would force Sherman to abandon Georgia and pursue him. Hood could then either turn and fight or, perhaps, even cross the mountains and join with Lee in Virginia. In late October, he briefed this grandiose plan to his new theater commander, General Pierre Beauregard. Beauregard was shocked, as he pointed out that Hood was abandoning the critical element of his earlier plan and the one considered sacred by both himself and the president: that he would pursue Sherman no matter what. However, after hearing Hood out, Beauregard reluctantly agreed to the plan. Nevertheless, he did insist on one change, ordering Joe Wheeler’s cavalry to be detached from Hood, so they could follow and harass Sherman. 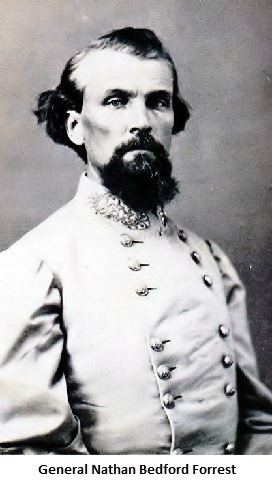 Wheeler’s men would be replaced with the cavalry of the legendary Nathan Bedford Forrest, currently operating in western Tennessee. Hood knew time was of the essence and immediately moved his army north to Guntersville, Alabama to await Forrest’s arrival. Unfortunately, the cavalry’s arrival was delayed by heavy fall rains and flooded rivers, so Hood moved further into northern Alabama to Tuscumbia to allow a quicker union with Forrest. However, when he arrived there on October 31, he found Forrest was still far away, further delayed by heavy rains, which also slowed the delivery of rations critical to the coming campaign. Hood had no choice but to wait for both Forrest and his supplies, a process that would take three weeks. Meanwhile, George Thomas began to assemble his new army and, on November 15, Sherman departed Atlanta to begin his inexorable march to the sea. As I indicated earlier, Hood and Thomas were men with vastly different approaches to war and, in some ways, no two men could have been more different. John Bell Hood has been described many different ways. Words like reckless, pugnacious, aggressive, hotheaded, mercurial, brave, and resolute have been used to characterize his fundamental approach to war and life. But I believe the word passionate best applies to this native Kentuckian. After all, the only two books he ever checked out from the West Point library while a cadet were Jane Porter’s Scottish Chiefs and Sir Walter Scott’s Rob Roy. In many ways, Hood was Quixotic, a romantic, passionate man better suited to another time. On the battlefield, Hood seemed to follow his heart more than his head. While serving as a brigade and division commander in Longstreet’s corps of Lee’s Army of Northern Virginia, Hood’s aggressive style was a perfect fit to Lee’s offensive mindset, and he would prove himself a critical asset in the legendary eastern Confederate army. 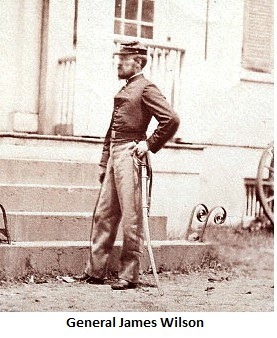 After he was seriously wounded at Gettysburg, he lost the use of his left arm. Following recuperation in Richmond, he returned to command the lead elements of Longstreet’s attack at Chickamauga, where he received an even worse wound, this time in the upper right thigh. The wound shattered his leg and led to amputation. Left with only a small stump, he would be forced to use crutches to walk and had to be strapped into the saddle atop his horse. Despite these wounds, wounds that would have left a lesser man prostrate, Hood lost none of his aggressive nature. He was a firm believer that his men would be better soldiers if they were used in frontal attacks, and that defensive fighting behind the safety of trenches and barricades made for lesser men. Therefore, when he took over command of the Army of Tennessee from the defensive-minded Joe Johnston, he immediately changed course and ordered a series of brutal offensive attacks against Sherman’s army, with nearly disastrous results. As his army awaited the move into Tennessee, he promised his men a different approach. He deliberately implied that there would be no more direct frontal assaults and that they would fight only when and where they had a distinct advantage. This led one officer from Texas to write that Hood said, “…we will have some hard marching and some fighting, but that he is not going to risk a chance for defeat in Tennessee. That he will not fight in Tennessee unless he has an equal number of men and choice of ground.” Sadly, this was a promise that the ever passionate Hood would not keep. Waiting across the line in Tennessee was George Thomas. Like Hood, there have been a variety of word used to describe Thomas as a soldier and a man, among them slow, cautious, deliberate, steadfast, loyal, brave, and stouthearted. Here, I opt for resolute and professional. George Thomas was a Virginian by birth and, when his native state seceded, there was never a question as to his loyalties. He was a man for whom the oath he had taken on the plains of West Point meant everything, even if it led to irrevocable separation from his family. After he announced his decision to remain in the U.S. Army and fight the rebellion, his sisters turned his picture to the wall, burned all his letters, and never spoke to him again. Through his steadfast nature and competent abilities as a soldier, Thomas steadily rose in command while serving in the West. He was a corps commander under Rosecrans by the time of the Battle of Chickamauga in September 1863, and it was here he would earn his famous nickname, “The Rock of Chickamauga.” As most of Rosecrans’ Army of the Cumberland disintegrated and fled back to Chattanooga, Thomas lone outnumbered XIV Corps held the line, beating back repeated Confederate attacks and stubbornly holding until they could fall back in order under the cover of darkness. His stand allowed Rosecrans and the army to reach the safety of Chattanooga and likely prevented their complete destruction. When Rosecrans was relieved and Grant was given overall command in the West, the new theater commander’s first act was to appoint Thomas to command in the besieged city of Chattanooga. Grant had strong reservations about Thomas, reservations that he never relinquished despite Thomas’ performance in the field. Grant saw Thomas as slow and overly cautious, a characteristic he considered fatal in a commander. Grant was almost certainly too harsh in his judgment. George Thomas was not so much cautious as he was deliberate. He would always make certain that, as much as was possible, he was ready to fight and able to fully leverage every possible advantage. Most importantly, however, when he was ready to fight, he would fight with tenacity and resolve. In many ways, given Hood’s passionate, sometimes reckless approach to battle, George Thomas was ideally suited to counter him. On November 21, Hood finally moved his men across the Tennessee River at Florence, Alabama, and headed for Tennessee. His three undersized corps consisted of 12 divisions with 38,000 men and 108 guns. Rations were still critically short, many of the men had no shoes, and their tattered uniforms barely clung to their backs. To make matters worse, while the rain had stopped, winter had arrived in full force. The ground was frozen hard and a cold wind accompanied by sleet blew in the men’s faces as they marched. However, many soldiers were optimistic. After all, the general had promised them only to fight when it was to their advantage and, besides, with more than 30 of Hood’s regiments being from Tennessee, many looked forward to returning to their home state and driving the hated enemy from its borders. As Hood began the campaign in earnest, George Thomas was scrambling to assemble an army to oppose him. 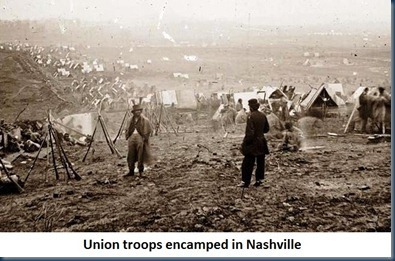 In early October, he had only about 10,000 troops plus quartermaster personnel in Nashville, with smaller detachments scattered about Tennessee and northern Alabama. Before he departed for Savannah, Sherman had ordered two fresh divisions from St. Louis to hurry east to reinforce Nashville. But, as Hood marched into Tennessee, they had not yet arrived. Thomas also knew that, with Forrest supporting Hood, he would be facing the South’s best cavalry. His own cavalry was not in good shape, so he placed James Wilson, an industrious young general, in charge of trying to reorganize his rather sad collection of troopers into something capable of countering the legendary Forrest. Thomas’ best and largest force consisted of two corps from Sherman’s army left behind to form the nucleus of his new army. These were the XXIII and IV Corps, a total of 30,000 men under the command of an ambitious 33-year old general named John Schofield. Schofield was one of those officers that peers and superiors soon learn to distrust, the sort of man who sends backchannel communications in which he criticizes the actions of his superiors and recommends their replacement. He was a soldier by training and profession, but a politician by nature. However, he was not entirely without ability and he had a nose for danger. As Hood moved north into Tennessee, his nose told him there was definitely trouble coming and it was headed straight for him. The danger Schofield sensed came from his position. Schofield’s 30,000 men were at Pulaski, Tennessee, astride the Franklin & Columbia Turnpike leading from Decatur, Alabama to Nashville. 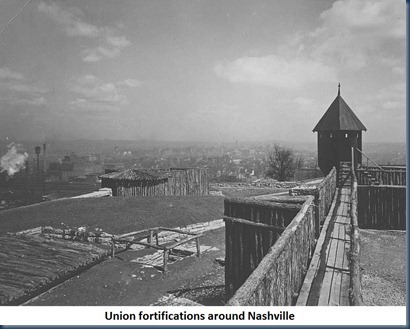 Nashville was approximately 60 miles in Schofield’s rear and Thomas had assumed that, once they knew Hood was moving, Schofield could simply retire to the north and join with Union forces in Nashville. Unfortunately for Schofield, both he and Hood realized there was one weakness in Thomas’ plan: the Duck River. That river lay halfway between Pulaski and Nashville, where the turnpike ran through the town of Columbia, Tennessee. If Hood could reach Columbia before Schofield, he could trap him south of the river, prevent his small army from reaching Nashville, destroy it, and then attack Thomas in Nashville. Schofield quickly got his men and their 800 wagons on the move in a race for Columbia and the Duck River. The sleet had now turned back into rain, making the roads a quagmire, but Schofield drove his men onward. To make matters worse for the retreating Union troops, Forrest’s cavalry began to make concerted attacks on the column’s rear and Wilson’s new and outnumbered cavalry faced the daunting task of trying to fend off the increasingly vicious assaults. Wilson’s efforts were not completely successful and the resulting Union losses were heavy. Still, he slowed Forrest enough to allow Schofield’s small army to reach Columbia on November 27 and secure the river crossing before Hood could get there. The Union troops quickly dug trenches and took defensive positions as Hood’s army arrived to their front from the south. With night approaching, the rain turned into sleet then snow, and the ground froze once more. Schofield realized that he was not out of danger, as Hood was capable of getting his army across the river via a ford, trapping him. Therefore, as darkness fell, he moved his army to the far side of the river and burned the both of Columbia’s bridges. For his part, John Hood immediately moved into Columbia and decided to wait until morning before sending his army east a few miles, where they would cross the river at a ford secured by Forrest and his cavalry. He would then make a rapid march to Spring Hill, 12 miles north up the turnpike, and, once again, seek to block John Schofield’s path to Nashville. HDQRS. CAVALRY CORPS, MIL. DIV. OF THE MISSISSIPPI, November 28, 1864–2.10 p.m.
MAJOR: Colonel Capron reports, 11.20 a.m., his force driven back from south side of Duck River by heavy force of the enemy; he is now fighting them across river. I move everything in that direction. Order Stewart’s brigade, sent below the town, to join me by the road toward Rally Hill; he will, however, have to keep well to the north, as the force crossing above Huey’s also seems heavy, from all I can learn. Maybe Stewart had better go pretty well up to Spring Hill before striking across. J. H. WILSON, Brevet Major-General. For some reason, Schofield was slow to respond to this news, despite its obviously ominous nature, and his intransigence continued for the balance of the day. Meanwhile, Hood began moving towards the Union rear. Next, in the early morning hours of November 29, Wilson once again sent additional news to Schofield, which seemed to confirm the worst: Hood was throwing pontoon bridges across the river and his infantry would soon be crossing in an attempt to get in the Union rear and block the turnpike. Again, despite this news, Schofield was unmoved. As the morning of November 29 dawned, the one unit left behind in Columbia by Hood kept up a constant bombardment of artillery fire, convincing Schofield that Hood still intended to attack across the river to his front, which was exactly what Hood wanted him to believe. Meanwhile, Hood, with one corps in the lead, was already headed towards the turnpike and Spring Hill. 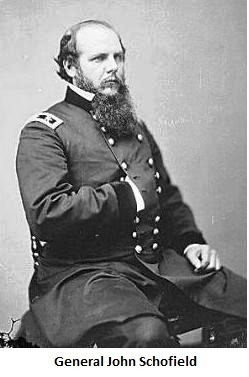 Schofield did decide to have General Stanley send two divisions from the IV Corps north towards Spring Hill, but that was his sole move in response to Wilson’s repeatedly urgent appeals. However, as fate would have it, this small move by Schofield proved a pivotal one. 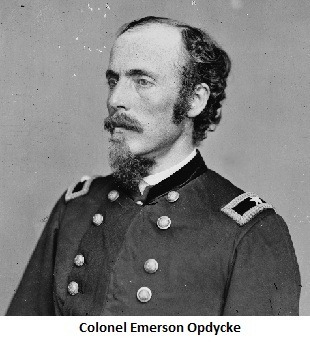 The Union troops moved rapidly up the pike and the lead brigade, led by Colonel Emerson Opdycke, a tough commander from Ohio, reached Spring Hill in time to fight off a determined attack by Forrest’s cavalry. General Stanley hurried the remainder of his lead division to join Opdycke’s brigade and, by 3:00 p.m., the Union troops were dug in and ready. Hood’s corps under General Cheatham drew up southeast of the town and, with a better than 2 to 1 advantage, Hood seemed assured of taking the vital crossroads. However, as Cheatham’s men went forward, nothing went right. 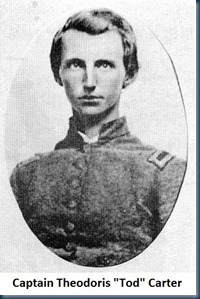 Forrest had not scouted the Federal positions and, therefore, the lead Confederate infantry under General Patrick Cleburne did not have accurate information on where Stanley’s line was placed. As a result, Cleburne’s men headed in the wrong direction and ended up presenting their exposed right flank to the Federal troops rather than coming at them head-on. As Union artillery and rifle enfiladed the Southern lines with deadly effect, Cleburne was forced to withdraw. Cheatham called for reinforcements but none could get into position before nightfall. Hood called off the attack and ordered the men to bivouac for the night. The attack on Spring Hill could wait until morning. However, what followed was one of the most bizarre incidents of the war. With the news of Cheatham’s attack on Stanley’s isolated division at Spring Hill, John Schofield finally figured out that he had been totally outmaneuvered by Hood. He had only one course of action: Pull out and hope that he could somehow get his men up the turnpike and past Hood’s army. Remarkably, as nightfall approached, Union scouts reported that the pike was still open—John Hood failed to order anyone to block it. The Confederate army was encamped nearby, at some places within 100 yards of the road. But, inexplicably there was not so much as a single Southern sentry watching the turnpike. Schofield’s men quietly stole up the road to Spring Hill, muffling every sound and even throwing blankets down on the wooden bridges to quiet the sounds of tramping feet and the wheels of hundreds of wagons. By 7:00 p.m., the lead Union brigades had already passed Hood’s army and made it to Spring Hill. 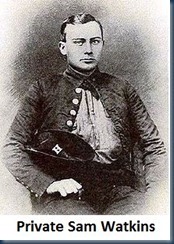 Captain James Sexton of the 72nd Illinois Infantry remembered the fateful night years later. We were in such close proximity to the Confederates, that we could see their long line of campfires as they burned brightly; could hear the rattle of their canteens; see the officers and men standing around the fires; while the rumbling of our wagon train on the pike, and the beating of our own hearts were the only sounds we could hear on our side. During the night, several reports reached Hood indicating that someone had seen or heard movement on the pike. However, in each case, Hood dismissed the report, pulled up his blanket, and remained snugly warm in his cot for the night. Meanwhile, the balance of 25,000 Federal troops marched past his army in the darkness to safety. By sunrise, Schofield’s entire force had reached Franklin, eight miles beyond Spring Hill. When Hood was informed of Schofield’s escape, he was livid, blaming everyone but himself for the turn of events. Even years later, he would write that the errors of his generals, in particular Cheatham, had destroyed the most brilliant military maneuver of his career. Worst of all for the men of his army, Hood’s anger now caused him to change his mind on how the Army of Tennessee would fight the campaign. The real problem, he decided, was that his men were soft and afraid to fight. This, he further concluded, was a lingering symptom from Joe Johnston’s preference for fighting from behind the protection of fortifications. The cure, he resolved, was to send his men into battle via the frontal attack. With his promise to his men now irrevocably broken, Hood set out to catch John Schofield and bring him to battle before he could reach Nashville. On November 30, 1864, John Hood has his men moving up the pike towards Franklin before the first light of dawn had even begun to peak over the eastern horizon. It was only eight miles to Franklin and, if he hurried his men, he might be able to catch John Schofield as the Union general scrambled to get his men and supply train across the Harpeth River, which ran its course immediately north of the town. The last of his army, Stephen Lee’s corps, which had remained behind to demonstrate in Schofield’s front and hold the Union army in Columbia, was already heading north but trailed the main body by several hours. A sudden change in sentiment here took place among officers and men: the Army became metamorphosed, as it were, in one night. A general feeling of mortification and disappointment pervaded its ranks. The troops appeared to recognize that a rare opportunity had been totally disregarded, and manifested, seemingly, a determination to retrieve, if possible, the fearful blunder of the previous afternoon and night. The feeling existed which sometimes induces men who have long been wedded to but one policy to look beyond the sphere of their own convictions, and, at least, be willing to make trial of another course of action. About two hours after sun up the next morning we received the order to “Fall in, fall in, quick, make haste, hurrah, promptly, men; each rank count two; by the right flank, quick time, march; keep promptly closed up.” Everything indicated an immediate attack. When we got to the turnpike near Spring Hill, lo! and behold; wonder of wonders! the whole Yankee army had passed during the night. The bird had flown. We made a quick and rapid march down the turnpike, finding Yankee guns and knapsacks, and now and then a broken down straggler, also two pieces of howitzer cannon, and at least twenty broken wagons along the road. Everything betokened a rout and a stampede of the Yankee army. Double quick! Forrest is in the rear. Now for fun. All that we want to do now is to catch the blue-coated rascals, ha! Ha! We all want to see the surrender, ha! Ha! Double quick! A rip, rip, rip; wheuf; pant, pant, pant. First one man drops out, and then another. The Yankees are routed and running, and Forrest has crossed Harpeth river in the rear of Franklin. Hurrah, men! keep closed up; we are going to capture Schofield. Indeed, John Schofield feared the same thing. He wanted to march the last 18 miles to Nashville, but upon arriving in Franklin, he discovered both bridges over the Harpeth had been damaged and would not support the weight of his troops and wagons. Worse, the river seemed unfordable and he had been forced to leave his pontoons behind in Columbia. His only recourse was to have his engineers repair the bridges. However, that delay meant exactly what John Hood was hoping for: the possibility that Schofield would be caught crossing the river when the Army of Tennessee arrived. Soon, however, scouts rode in to tell Schofield that they could ford the river; however this would still mean a slow crossing and the potential of being trapped midstream by Hood. Therefore, Schofield decided to send some of his artillery across the river and position them in a redoubt on the north bank, along with most of IV Corp’s infantry. He also ordered Wilson to take his cavalry to the far side of the river as well, patrolling the north bank to prevent either Forrest’s cavalry or Hood’s army from crossing on his flank again. As for the rest of the army, they were told to quickly erect field fortifications in a semicircle along the town’s southern boundary in case they had to make a fight of it. Schofield hoped he could avoid a battle before nightfall, when he would get his wagons and men across the river once more under the protection of darkness. While deeply fatigued from a night of marching, the Union troops began work in earnest. Using the home and cotton gin belonging to a man named Fountain Branch Carter as a center point, the soldiers of XVII Corps dug a formidable series of rifle pits and breastworks that stretched from the banks of the Harpeth west and above Franklin to the river shores east of town. 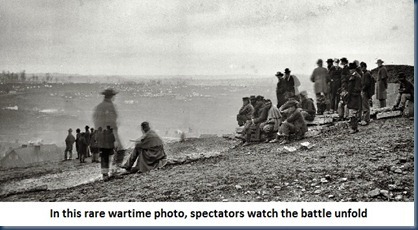 The ground in front of them made for one the best defensive positions the war had ever seen. For nearly two miles to the south of the Union lines, the ground was flat and nearly devoid of trees. There was no cover for any attacking force and the only high ground, Winstead Hill, was too far away to afford any advantage to Hood’s men. In fact, one Federal division under General Wagner was posted to the top of the hill to watch for Hood’s approach, which came in the early afternoon. At 2:00 p.m., Hood could plainly see Wagner’s colors flying at the top of Winstead Hill as he rode north up the pike. He ordered Stewart’s corps forward to flank the hill and force the Federals from the high ground, which they did, sending Wagner falling back towards the Union lines around Franklin. 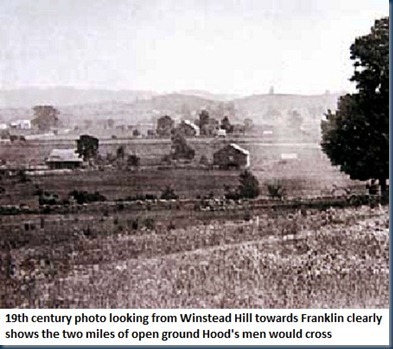 Hood and his staff rode to the top of Winstead Hill so they could observe what was happening in Franklin. What they saw was almost certainly unexpected. The Federal army was not in the process of fleeing across the river but, rather, was entrenched and ready to fight. Hood was unstrapped from his horse and he hobbled forward using his crutches. He raised his glasses and studied the Union positions for a very long time. What happened next is unclear. Hood recalled giving orders to Cheatham and Stewart to deploy their corps to the left and right of the turnpike, respectively, and force the Federals into the river via a direct, frontal assault, orders that, in his recollection, were met with enthusiasm. However, the picture provided by others was not so rosy. It is reported that Forrest counseled against a frontal attack, suggesting that he and one division of infantry flank Schofield and drive him out of the entrenchments. General Cheatham agreed, saying, “I do not like the looks of this fight; the enemy has an excellent position and is well fortified.” Meanwhile, Patrick Cleburne, the hard fighting Irish division commander from Stewart’s corps, declined to state his opposition openly. Instead, looking at the Union fortifications, he quietly murmured, “They are very formidable.” While Hood would later say Cleburne was particularly enthusiastic, one of Cleburne’s brigade commanders, General Govan, recalled that, before the assault, the Irishman was “more despondent” than he had ever seen him. But Hood’s decision was final: the army would attack immediately and destroy Schofield before darkness. Given what would happen between the moment of his decision and darkness several hours later, one has to wonder what drove Hood to this decision. The odds were not good and one of his corps, that of Stephen Lee, and much of his artillery would not arrive until nearly dark. Hood would later write that artillery was not a concern because he deferred from using mass artillery barrages, lest it indiscriminately kill the civilians in the town. Some would say that Hood was determined to “blood” his men and raise their fighting spirit by aggressively attacking the enemy. That was probably an element in his decision, but how influential an element is a question. It probably was not as critical as much as some might argue, but it was certainly more important than offered by his later supporters and apologists. I suspect the truth is somewhere in the middle. More than likely, the biggest single thing driving his decision was his determination to not let John Schofield slip away again. Fate had presented this opportunity and he was not going to let it slip from his grasp. His attack plan was simple and, perhaps, murderously so. He would advance seven brigades directly up the pike at the center of the Federal line; while six brigades would assault the Union right and four more would advance against the left. Beyond that, there was no real planning involved. The idea was to attack and do so quickly before nightfall. At 3:00 p.m., as the bright sun began to move lower in the late fall sky, the Army of Tennessee moved forward and prepared for the attack. On the Union side, all was in preparation but there were imperfections in the defenses. At the apex of the Federal line astride the turnpike, there was a gap in the breastworks left there by design. General Cox felt that he needed to allow a way for Wagner’s men to retreat back inside the Federal works, so he ordered the gap be left open and defended by a battery of four guns. He added a trench line about 200 yards to the rear and across the road, and placed additional guns on high ground to the rear so they could sweep the front if necessary. However, the biggest weakness involved Wagner’s division. As his division retreated from Winstead Hill, Wagner received orders to form his men about one-half mile in front of the main line in what was an extremely exposed position. To this day, no one is certain from where those orders came or precisely what the instructions ordered. Several officers maintained that they were told only to remain in place until they observed Hood’s main force advance and then they were to fall back into the fortifications. However Wagner believed that he was hold his line at all costs. The last of his brigades to reach the new position was that of Colonel Opdycke. 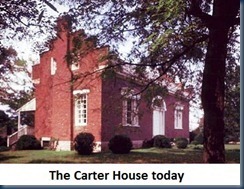 When he heard that Wagner was determined to hold his ground, Opdycke refused to do so and led his men into Franklin, where he ordered them to fall out and rest near the Carter House. Meanwhile, at 3:30 p.m., Hood’s men began to move forward, bands playing and their tattered colors flapping in the breeze. By all accounts, it was a magnificent sight. One Union infantryman later recalled that, “It looked to me as though the whole South had come up there and were determined to walk right over us.” As Hood’s men approached, the men in Wagner’s exposed division began to become uneasy, not because they were cowards but because, as veterans, they knew they had no business trying to fight where there were. As Federal artillery opened fire on Hood’s advancing lines, Wagner’s men poured a massive volley into the Confederates. At that, the attacking line broke into a run, the rebel yell coming from every throat. Wagner’s line immediately broke and thousands of Union troops ran for the safety of Franklin, as mass confusion broke out. Hood’s men ran right behind them, actually mixing in with the retreating Federals. Neither side could fire into them and were forced to wait for a clear line of fire. Wagner’s fleeing troops soon reached a point where locust trees had been felled to form a natural abatis across the road. In their panic, many Union soldiers became entangled in the trees only to be killed by their pursuers. As the Confederates paused to deal with the abatis and the men caught in it, the remainder of Wagner’s men ran past, through the gap, and into Federal lines. As soon as they cleared the gap, Union guns began to rake the Confederates with canister, but the weight and speed of the attack was too strong to stop. The butternut-clad attackers poured into the gap and the Federal defenders positioned there fled north up the streets of Franklin, joining Wagner’s panicked brigades. Schofield’s defenses had broken at what was supposed to be their strongest point and a seemingly irresistible flood of Confederate troops was pouring into Franklin. By all appearances, a Union disaster was in the making and John Hood’s hope for a major victory suddenly seemed bright. In a meadow near the Carter House, Emerson Opdycke had heard the firing begin and, as the sounds of battle grew louder, he ordered his men into line. They had been resting, making coffee with their rifles stacked nearby. Just as the men took their positions, Opdyke turned and saw the mass stampede of Union soldiers running up the street, followed by Hood’s men. He shouted for the brigade to go forward and his men ran past the Carter House, gathering two Kentucky regiments and those from Wagner’s brigades who still had some fight left in them in the process. Running full speed, the wave of blue collided head-on with the surging Confederates. What ensued was the most brutal hand-to-hand combat of the entire war. Private Arbridge of Company D, 72nd Illinois, thrust his musket against the abdomen of the rash colonel, and with the exclamation, “I guess not!” instantly discharged his weapon. The effect of the shot was horrible and actually let daylight through the victim. The doomed warrior doubled up, his head gradually sinking forward and downward until he finally plunged head foremost into the pit below, at the very feet of his slayer. 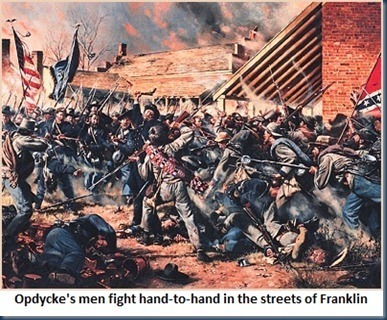 Opdycke’s counterattack proved too much for the Southern attackers, who fell back, eventually going up and over the breastworks, and finally seeking cover at the foot of the fortifications. Opdycke’s men seized control of the gap and quickly erected a barricade, as the Federal crisis ended. However, all along the line Hood’s men continued to press their attack, surging ahead into waves of rifle and artillery fire like men walking into a strong wind. Many made it to the base of the Federal earthworks only to have the attack stall out, while others were simply stopped in their tracks as men fell by the dozens. Those who made it to the foot of the Union barricades now were trapped. To retreat meant being shot down from behind while going forward over the breastworks would result in certain death or capture. So, for hours, they would remain there, shooting at any blue cap that showed itself, and being shot down by the defenders, many of whom simply pointed their rifles down into the pit and fired blindly. Up and down the line, the story was the same. Hood’s assault ground to a halt and the death toll mounted steadily. As night fell, many of the men trapped in front of the Federal lines began to surrender and those that could fell back toward Winstead Hill. The Battle of Franklin had ended and, by 3:00 a.m., Schofield’s army at last made its final escape across the Harpeth, burning the bridges behind them as they hurried north to Nashville. But when the morrow’s sun began to light up the eastern sky with its rosy hues, and we looked over the battlefield, O, my God! what did we see! It was a grand holocaust of death. Death had held high carnival there that night. The dead were piled the one on the other all over the ground. I never was so horrified and appalled in my life. This is not the kind of fighting he promised us at Tuscumbia and Florence when we started into Tennessee. This was not a “fight with equal numbers and choice of the ground” by no means. And the wails and cries of widows and orphans made at Franklin Tenn Nov 30th 1864 will heat up the fires of the bottomless pit to burn the soul of Gen J B Hood for Murdering their husbands and fathers at that place that day. It can’t be called anything else but cold blooded Murder. And in this perverse war among countrymen, fighting in their own towns, there would be loss that was painfully close to home. 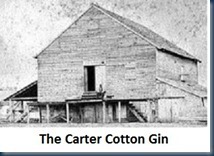 Fountain Branch Carter, whose home and cotton gin would be the center of so much fighting, had a son who was serving in Hood’s army. Theodoric Carter, known affectionately as Tod to his family, was a captain on General Thomas Smith’s staff and had participated in the attack on November 30. The next day, a Confederate soldier came to the Carter home and told the elder Carter that his young son had been badly wounded. Carter and another of his sons went in search of him. At first, they could not find him but, eventually, General Smith led them, along with three of Mr. Carter’s daughters and a daughter-in-law to where Tod lay on the field, nearly in sight of his boyhood home, which he had not seen in more than two years. His family lifted him gently and carried back to the house where he would die of his wounds the next day. The commanding general congratulates the army upon the success achieved yesterday over our enemy by their heroic and determined courage. The enemy have been sent in disorder and confusion to Nashville, and while we lament the fall of many gallant officers and brave men, we have shown to our countrymen that we can carry any position occupied by our enemy. About 4 p.m. November 30 we attacked the enemy at Franklin and drove them from their center lines of temporary works into their inner lines, which they evacuated during the night, leaving their dead and wounded in our possession, and retired to Nashville, closely pursued by our cavalry. We captured several stand of colors and about 1,000 prisoners. Our troops fought with great gallantry. We have to lament the loss of many gallant officers and brave men. Major-General Cleburne, Brig. Gens. John Adams, Gist, Strahl, and Granbury were <ar94_644> killed; Maj. Gen. John C. Brown, Brigadier-Generals Carter, Manigault, Quarles, Cockrell, and Scott were wounded; Brigadier-General Gordon was captured. Meanwhile, George Thomas awaited John Hood in Nashville, where the last act would finally be played. While John Schofield and John Hood had been playing out their own drama on the pike to Nashville, George Thomas had been a waging a three-front war of his own. First, he had been in constant contact with Schofield, urging him on and providing what little support he could. He was terribly anxious to get IV and XXIII Corps back to Nashville, and feared that Hood might, indeed, succeed in nabbing Schofield before he could escape. Therefore, Schofield’s dispatch from Franklin was a very welcome sight. FRANKLIN, November 30, 1864–7.10 p.m. The enemy made a heavy and persistent attack with about two corps, commencing at 4 p.m. and lasting until after dark. He was repulsed at all points, with very heavy loss, probably 5,000 or 6,000 men. Our loss is probably not more than one-tenth that number. We have captured about 1,000 prisoners, including one brigadier-general. Your dispatch of this p.m. is received. I had already given the orders you direct, and am now executing them. By late afternoon on December 1, Schofield’s command marched into the defenses of Nashville, helping Thomas with his second problem, that of forming an army of sufficient size and strength to overwhelm Hood and the Army of Tennessee. Ever since Sherman had assigned him the duty of protecting the Union rear in Tennessee, Thomas had been waging a continual campaign to find men and material, and organize his new army. The struggle had not been an easy one. General Smith’s XVI Corps had been ordered east to Nashville from Missouri in mid-November, but had struggled against the weather, first in the form of torrential rains and then early snows in Missouri. They eventually made it to St. Louis on November 24, where they boarded steamers for the final leg of the journey up the Mississippi to the Ohio and then down the Cumberland River to Nashville. Just before Schofield and his corps arrived, the ships carrying Smith’s men docked in Nashville. That evening, another group of reinforcements, a provisional division and two brigades of black soldiers, arrived in Nashville under the command of General James Steedman. Now, with nearly 50,000 men under his command, Thomas felt better about his situation. However, most of the new troops were raw and inexperienced, and Thomas needed to get this new army organized to fight. Plus, there was the issue of his cavalry. If he were to take on John Hood, he wanted a cavalry force capable of handling the legendary Forrest. He had enough men, with about 15,000 troopers, but mounts were a serious issue. 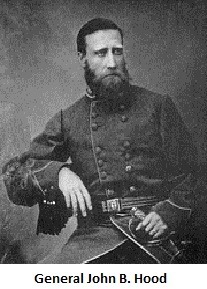 Many of his cavalry did not have horses and, upon arriving in Nashville, Wilson’s were about played out. So, Thomas set about trying to find sufficient horseflesh to mount his cavalrymen, a process that would take several days to complete. In the meantime, John Hood and his army arrived outside Nashville in the early afternoon of December 2, and began to dig in just south of the city. However, the toughest battle George Thomas would fight was the one he fought with his own chain of command. As I mentioned in the first part of this series, Ulysses Grant, ever the bold, aggressive, audacious soldier, considered the deliberate Thomas to be a “plodder,” a trait he could not abide. As Thomas labored to bring his command together, Grant tried to give him some room, but Grant himself was besieged by a constant stream of urgent dispatches from Washington demanding that Thomas take to the field. At his end, what George Thomas saw was a three-headed monster spewing messages urging him to take the field. That monster was a product of the command structure Lincoln and Grant had carved out together and, while it was very effective for the most part, here it created command chaos. 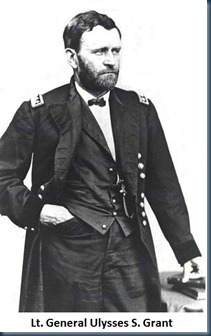 In the Union command system at the end of the war, Grant was General-in-Chief of all Union ground forces, and he worked from the field, accompanying George Meade and the Army of the Potomac as they campaigned against Lee. 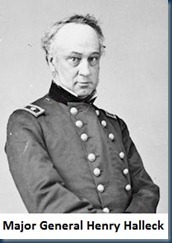 Meanwhile, in Washington, Grant’s predecessor, General Henry Halleck, functioned as his Chief of Staff. Halleck’s job was to interpret Grant’s communications for President Lincoln and provide the president’s views to Grant. 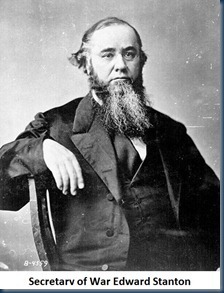 The third element in this mix was Edwin Stanton, the Secretary of War. 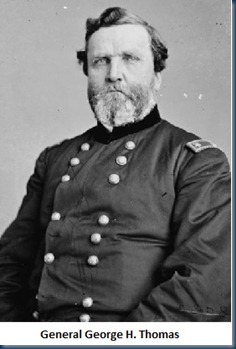 Stanton seems to have operated somewhat independently, communicating directly with Grant at times, through Halleck on occasion and even directly with Thomas now and then. But no matter who the dispatches came from, the message to Thomas was always consistent: attack Hood now. Washington, December 2, 1864–10.30 a.m. The President feels solicitous about the disposition of General Thomas to lay in fortifications for an indefinite period “until Wilson gets equipments.” This looks like the McClellan and Rosecrans strategy of do nothing and let the rebels raid the country. The President wishes you to consider the matter. CITY POINT, VA., December 2, 1864–11 a.m. If Hood is permitted to remain quietly about Nashville, you will lose all the road back to Chattanooga, and possibly have to abandon the line of the Tennessee. Should he attack you it is all well, but if he does not you should attack him before he fortifies. Arm and put in the trenches your quartermaster employés, citizens, &c.
CITY POINT, VA., December 2, 1864–1.30 p.m.
With your citizen employés armed, you can move out of Nashville with all your army and force the enemy to retire or fight upon ground of your own choosing. 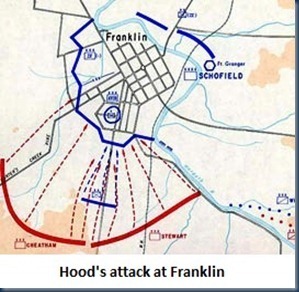 After the repulse of Hood at Franklin, it looks to me that instead of fal1ing back to Nashville, we should have taken the offensive against the enemy where he was. At this distance, however, I may err as to the best method of dealing with the enemy. You will now suffer incalculable injury upon your railroads, if Hood is not speedily disposed of. Put forth, therefore, every possible exertion to attain this end. Should you get him to retreating, give him no peace. Thomas responded prudently, sending dispatches to both Halleck in Washington and Grant at City Point. He carefully stated the situation trying to help them see that he was close to being ready, but that he needed time, hopefully only two or three days. He reminded Grant that the two corps Schofield provided were the weakest in Sherman’s army and that he needed to get the mix of men from Schofield, Smith, and Steedman organized into a command capable of fighting. He also told Halleck that, essentially, Hood was not going anywhere. Thomas had wisely ordered the Navy’s gunboats to constantly patrol the Cumberland, watching for any signs of a crossing, which they were to oppose vigorously, if discovered. What no one seemed to see is that Thomas had the situation well in-hand. He was not shrinking from a fight, as Stanton and Lincoln feared. Rather, he was ensuring that he could execute the maximum combat power possible against an enemy who was exactly where he wanted him. By allowing Hood to deploy outside the city, Thomas had permitted his opponent, now outnumbered and operating on short rations, to further extend and expose his lines of communication and supply. Further, Thomas had no intention of remaining on the defensive. Once he was ready, he fully intended to strike Hood and strike him hard. But this was apparently lost on his chain of command, who continued to see only needless delay. CITY POINT, VA., December 6, 1864–4 p.m. Attack Hood at once, and wait no longer for a remount of your cavalry. There is great danger of delay resulting in a campaign back to the Ohio River. Thomas replied, saying, “Your telegram of 4 p.m. this day is just received. I will make the necessary dispositions and attack Hood at once, agreeably to your order, though I believe it will be hazardous with the small force of cavalry now at my service.” The next afternoon, December 7, Grant’s impatience began to get the better of him, and he wrote Secretary Stanton that, if Thomas did not attack immediately, he would order Schofield to assume overall command, reassigning Thomas to be his subordinate. Grant then wrote Halleck on December 8, saying, “If Thomas has not struck yet, he ought to be ordered to hand over his command to Schofield. There is no better man to repel an attack than Thomas, but I fear he is too cautious to ever take the initiative.” George Thomas might be steadily preparing to win a military battle in the field, but he was rapidly losing the political battle east of the Appalachians. Washington, D.C., December 9, 1864. Please telegraph order relieving him (General Thomas) at once and placing Schofield in command. Thomas should be directed to turn over all dispatches received since the battle of Franklin to Schofield. I. That Maj. Gen. J. M. Schofield assume command of all troops in the Departments of the Cumberland, the Ohio, and the Tennessee. II. That Maj. Gen. George H. Thomas report to General Schofield for duty and turn over to him all orders and dispatches received by him, as specified above. But, the message was not sent immediately. Halleck wrote directly to Thomas, again urging him to move against Hood and adding that General Grant was very dissatisfied with his performance. Thomas replied, again stating his need for horses, but he added news of a new development: a major ice storm had struck Nashville on the morning of December 9 and there was no possibility of an attack, as the ground was totally coated with ice and more was coming down. He then telegraphed Grant, telling him that, “Major-General Halleck informs me that you are very much dissatisfied with my delay in attacking. I can only say I have done all in my power to prepare, and if you should deem it necessary to relieve me I shall submit without a murmur.” In fact, two hours before Thomas wrote to Grant, the commanding general had issued orders to relieve Thomas of command. CITY POINT, VA., December 9, 1864–7.30 p.m. Your dispatch of 1 p.m. received. I have as much confidence in your conducting a battle rightly as I have in any other officer; but it has seemed to me that you have been slow, and I have had no explanation of affairs to convince me otherwise. Receiving your dispatch of 2 p.m. from General Halleck, before I did the one to me, I telegraphed to suspend the order relieving you until we should hear further. I hope most sincerely that there will be no necessity of repeating the orders, and that the facts will show that you have been right all the time. The ice storm eventually abated, but the temperatures were now so low every surface was coated in several inches of ice. There was no way a man could walk upright on even a level surface, much less an army move to the attack. When Thomas informed Halleck and Grant on December 11 that it was impossible to attack until a thaw took place, Grant again ordered him to attack without delay “for weather or re-enforcements.” But, again, Thomas deferred and Grant finally decided it was time to relieve his plodding general and to do so himself. He left City Point en route to Nashville via Washington. On December 14, as Grant traveled north to the capital, Thomas telegraphed Halleck that the ice was melting and that he would launch his attack the next morning. As George Thomas battled his own chain of command, John Hood and his army fought Mother Nature. Their entrenchments were about 10 miles south and southeast of Nashville. The right end of their lines stopped about a mile short of the Murfreesboro Turnpike, where Cheatham’s corps dug in. From there, the Confederate line ambled generally west and southwest, with Lee’s corps in the center, until it reached a point just short of the Hillsboro Turnpike. There, the line turned almost 90 degrees and ran south in parallel to the pike, where Stewart’s battered corps held the line. Hood only had enough men to cover about four miles and, even at that, his men were stretched dangerously thin. He had requested reinforcements, but none were on the way. Meanwhile, his men shivered in the cold, many with no shoes or even head gear. Unlike their Federal opponents, there were no warm tents, much less barracks. Instead, they dug holes in the frozen earth as best they could, lined them with twigs and leaves, and then huddled together, three and four men to a hole, trying to find warmth under threadbare blankets. 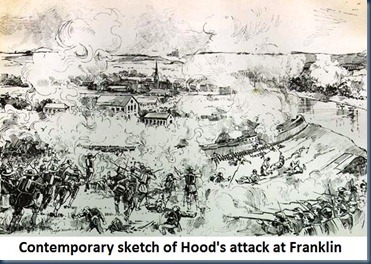 Hood’s plan was to withstand the coming Federal assault, smash it, and then launch a swift counterattack that would send the Union forces reeling from the city. Given that plan and the fact that the massive Union line overlapped his significantly, it is odd that, on December 7, Hood sent almost all of Forrest’s cavalry and one division of his precious infantry to perform what he later called “a reconnaissance in force” of nearby Murfreesboro. If Forrest thought he could take the Federal garrison there, he was to do so, perhaps in the hope that Thomas would weaken his force to stop Forrest. However, Forrest determined this was not feasible and, while he sent the infantry back to Hood, he remained near Murfreesboro. As a result, Hood would go into the fight against Thomas without his “eyes,” which he badly needed to cover his extremely vulnerable flanks. When December 15 dawned, the sun struggled to burn through a blinding white fog that blanketed the hills around Nashville. The ground was muddy as a result of the melted ice, slowing Union units moving forward to prepare for the attack. The terrain between the Union fortifications and Hood’s line consisted primarily of open, rolling farmland, punctuated by numerous ridges and small knolls that rose 200 to 300 feet above the fields surrounding them. There was plenty of room for maneuver and clear fields of fire. Thomas’ plan of attack called for a feint against Hood’s right, where Steedman’s command would attack Cheatham and try to hold him in place. Meanwhile, Smith’s XVI Corps and Wood’s IV Corps, supported by dismounted cavalry from Hatch’s division, would swing wide to the right and make an enveloping attack against Stewart on the Confederate left. Schofield and his XXIII Corps would be held in reserve and move forward to exploit any gains made by Smith and Wood. By 8:00 a.m., the fog began to lift and Steedman launched his attack against Hood’s right. While it was the first combat for his black brigades, they attacked with ferocity, climbing the hills where Cheatham was entrenched in the face of a murderous fire. They succeeded in capturing the first line of Confederate rifle pits, but then their attack bogged down. Still, they would hold this position and keep up a hot and continuous fire on Hood’s men. 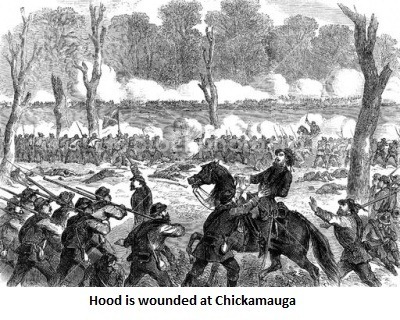 This had the desired affect: Hood believed that the main Union assault was being made on his right and Cheatham would be heavily engaged there for most of the day. While all this was happening, the real threat was steadily approach Hood’s left and, without Forrest’s cavalry to warn him, he never saw it coming. The IV and XVI Corps swept forward, knocking Stewart’s men off Montgomery Hill and then they swarmed over the artillery redoubts Hood had constructed near the Hillsboro Pike. 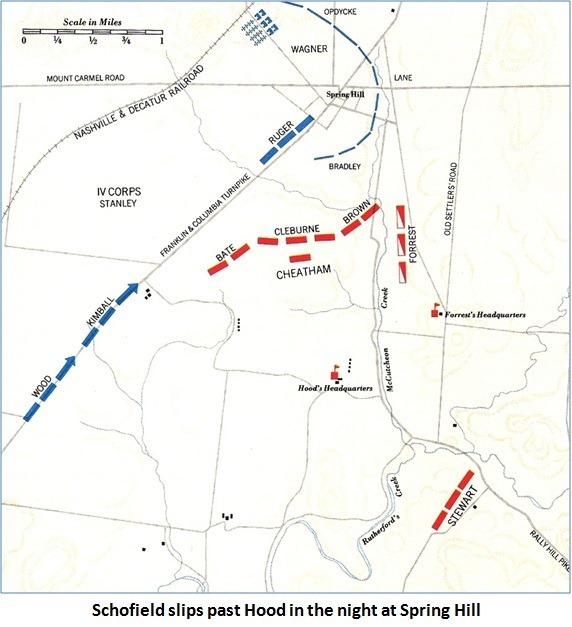 At 1:00 p.m., Thomas committed Schofield’s Corps to the attack and sent all of Wilson’s cavalry to the right, in an attempt to cut off Hood’s escape routes. 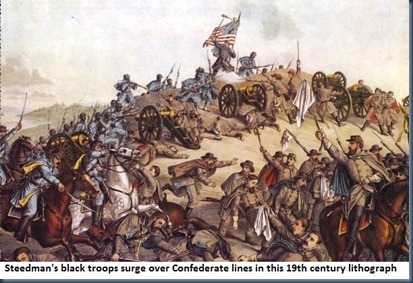 Thirty minutes later, the wave of blue-clad infantry crashed through the main Confederate fieldworks and broke the salient in the Southern line. Stewart’s men began a retreat to the southeast toward the Granny White Turnpike, and the entire Confederate left collapsed. The retreat was, however, not a panicked one, as most units fell back in good order. As the left moved back, Cheatham also began to retreat, as Federal units maintained a constant pressure. As darkness began to fall, Hood reorganized his line about two miles to the south and had his men dig in, his line now shrinking from four miles to only two. Luckily, Thomas’ attackers became disorganized by their success and the Union pursuit had to be halted for the night. Hood hoped to counterattack in the morning, while Thomas planned to continue the attack at first light. It would be a matter of who moved first. Thomas decided to begin the next day with a massive artillery barrage, then execute another flanking attack on the Confederate left, while he simultaneously pushed hard against the Southern center and right. For his part, Hood rearranged his forces, placing Stewart’s men in the center with Lee on the right and Cheatham on the left. When December 16 dawned, Thomas would move first. Union artillery opened up at 9:00 a.m., and continued firing for two hours. At 10:00 a.m., Steedman’s men assaulted the Confederate right, but could not make any gains against Lee’s corps, who stubbornly held their ground against repeated attacks. As these assaults continued, the Union artillery shifted their fire to Hood’s left against Cheatham’s corps. Because of their position, the Federal batteries were soon pouring a relentless barrage that enfiladed Cheatham’s line and, by 3:30 p.m., as XVI and XXIII Corps smashed into the Southern left, Cheatham’s infantry had essentially been neutralized as a fighting force. As Union infantry broke through the line, the entire Confederate left broke and the center would soon follow. This time, the retreat was not orderly, as men fled for their lives. 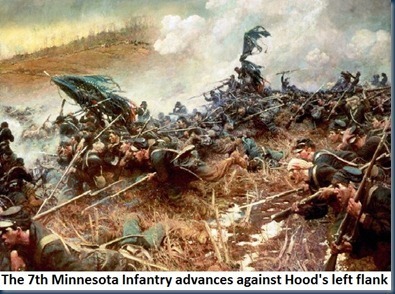 Only Lee managed an orderly retreat and his fighting withdrawal probably saved Hood’s army from an even greater disaster. That night, Hood skillfully reorganized what was left of the Army of Tennessee and began a full retreat. The next morning, George Thomas would send Wilson’s cavalry in pursuit but, once again, the weather intervened. Wilson was slowed by the muddy roads, as well as an effective rear guard fight put up by Confederate cavalry and infantry. When Forrest rejoined Hood on December 18, pursuing Federal troops had no hope of closing in any further. When Hood finally crossed the Tennessee River on Christmas Day, the Union pursuit ended for good. 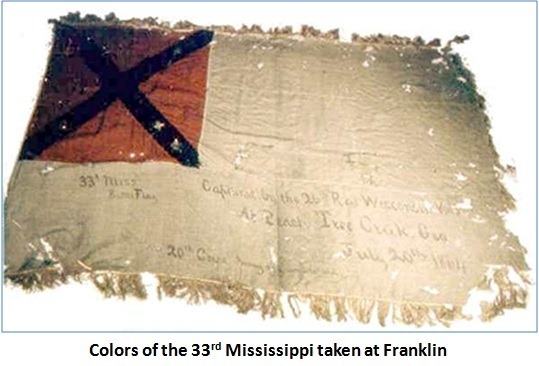 Hood would withdraw to Tupelo, Mississippi and could only muster 15,000 men upon arrival there. With the campaign concluded, the last major fighting in the Western Theater was finally at an end. The focus would now turn to the east, as Sherman’s army moved inexorably north up the coast, leaving a path of destruction through South Carolina. The final drama would be performed in Virginia and North Carolina, but the war’s outcome had already been determined in the West.